'From Farm to Table' encourages viewers to discover the bounty of New York's Capital Region, from the fields to the dinner table. A collaborative production of WMHT and Cornell Cooperative Extension, the series explores local farms and highlights New York state products. Join nutrition educator Kim Sopczyk as she shows viewers how to make the most out of fresh local produce. 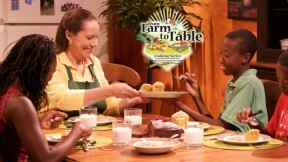 'From Farm to Table' offers valuable cooking ideas and tips on how to stretch food dollars, while introducing viewers to local farmers and regional experts with valuable knowledge to share.